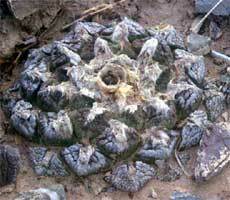 Ariocarpus fissuratus lloydii LRM194, at Laguna Viesca. 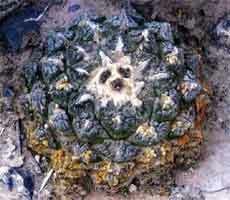 Ariocarpus fissuratus lloydii LRM194, a large specimen growing at Laguna Viesca. Ariocarpus fissuratus lloydii LRM194, a seedling plant. Variously classed as A. intermedius or A. lloydii, the plants of A. fissuratus found in the hills around Laguna Viesca appear to be an extension of the A. lloydii population in the Sierra Parras. 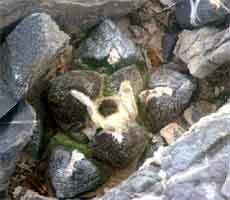 Plants are quite scarce in the region occurring in small localized colonies.